I am making the presumption here that people know how to make a Bolognese sauce – just fry up some chopped vegetables of your choice, I use onion and mushrooms normally, season, bang in a bag of vegemince and add plenty of chopped tomatoes and puree. The longer you leave it to cook, the richer the flavours tend to be. Could add a splash of red wine too, for a little added luxury. Heat 2 tbsp of soya margarine in a saucepan and add 25g plain flour. Stir over a gentle heat for a minute or two, but don’t let the flour brown. Slowly add 300ml soya milk, whisking as you go to stop it turning lumpy. The flour will cause the sauce to thicken as it heats. Heat it through properly to allow the flour to cook. You want it pourable without being too runny. Season with salt, pepper and a touch of nutmeg if that’s your kind of thing. It’s definitely my kind of thing. Then, all you need is your sheets of pasta and perhaps a vegetable layer if you like. 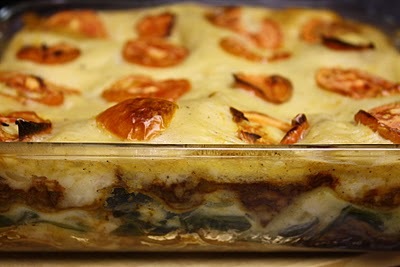 I chose spinach for this particular lasagne – it is one of the best I reckon but I would like to try layers of lightly fried aubergine one day – turn it into a bit of a moussaka. I take a large, square glass dish and start with a layer of Bolognese. I always dip my pasta sheets in water before I lay them down – I find it helps them cook more easily. On top of the pasta comes a layer of spinach and white sauce, then another layer of pasta. Layer of Bolognese, another layer of pasta and then a final layer of white sauce to give a creamy topping. As seen in the photo, I like to finely slice a tomato and place it on top. I find oven baked tomato gives off this wonderful flavour which is a pleasant addition to most pasta dishes. A sprinkling of ‘parmesan’ finishes it off nicely. Baked in the oven until a knife slices easily through all the layers of pasta and the topping is brown and bubbling. Do you know what the great thing about this is? It’s a meal in itself I find – carbohydrate, protein and vegetables all in one..... and..... it goes rather well with a nice glass of red wine.